Rice recorded 45 sacks in four collegiate seasons and, considered the best pass rusher available in the draft, he was taken with the third overall pick in the first round by the Cardinals and their defense-minded new head coach, Vince Tobin. While he held out into training camp, Rice still moved into the starting lineup. Having tied the NFL record for sacks by a rookie, Rice had a lesser performance in 1997 with five sacks, but bounced back in ’98 as the Cardinals made it to the postseason and in 1999 he was selected to the Pro Bowl after accumulating a career-high 16.5 sacks. 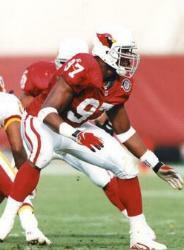 Unhappy with his contract, he left Arizona following the 2000 season and signed with the Tampa Bay Buccaneers. As part of a strong overall defense, Rice had his best years. Considered a one-dimensional player with the Cardinals, he improved against the run with the Bucs while reaching double digits in sacks in each of his first five years with the club. He also was a consensus first-team All-Pro in 2002 and was selected to the Pro Bowl in ’02 and ’03. A shoulder injury caused him to miss half of the 2006 season and he finished up with the Broncos and Colts in ’07. For his career, he had 122 sacks and was selected to the Pro Bowl on three occasions.